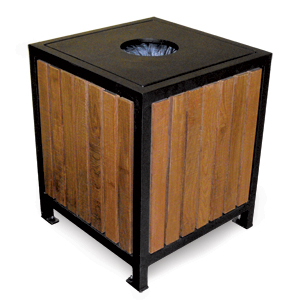 This wood panel litter receptacle adds a rustic touch of elegance to any environment. Available in your choice of tight knot Cedar or South American cultivated Pau Lopé hardwood, this unique trash receptacle can be used both indoors and outdoors to hold up to 20 gallons of waste. Also check out Belson Outdoor's Regency Style Wood Benches and Planters to create an entire setting of charming wood products.